Challenge = The River Cottage had no mains water, gas or electricity. During works a 13 metre deep well was found at the rear of the property, directly under the proposed new build extension. Solution = Pickford Builders recently completed a full restoration to a Grade II Listed 18th century cottage, which was on the East Hertfordshire Heritage At Risk Register. 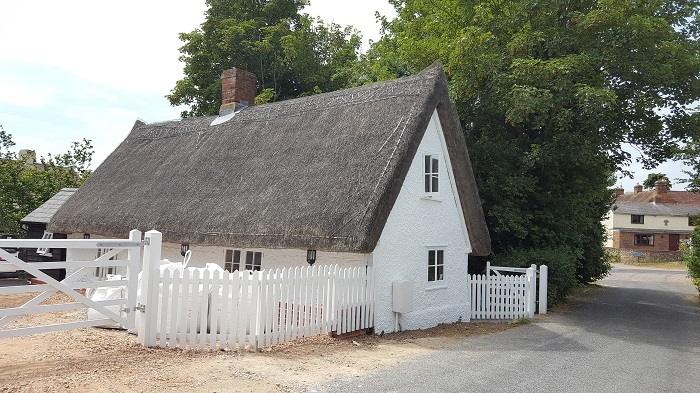 The cottage which had been left unoccupied over 50 years, has a thatched roof and is timber framed with a render flint and brickwork cladding. Works included alterations key to bringing the cottage back to functional use as well as a sympathetically designed new rear extension. The cottage is a heritage asset and contributes to the historic building stock in the Albury area; therefore the alterations were designed to prevent loss of historic fabric and have a positive impact on the use of the building and its ongoing usefulness. The cottage required extensive underpinning to the majority of elevations, due to being situated adjacent to the River Ash. During works, a 13 metre deep well was found at the rear of the property, directly under the proposed new build extension. As a result of the find, Pickford Builders instructed structural engineers to re-design the foundations. The project started February 2018 and was completed at the beginning of July 2018.